This edition of the Foreign Policy Centre’s Iran Human Rights Review (IHRR) focuses on the relationship between Iran and the United Nations. Academic and civil society experts put forward a range of different perspectives with a particular focus on how the country interacts with UN human rights mechanisms and its commitments under international law. 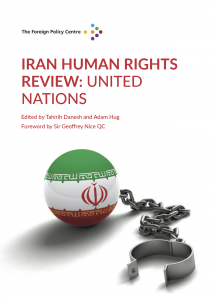 The review looks at issues including the lack of access to Iran for UN Special Rapporteurs, the country’s approach to the Universal Periodic Review process, the problems facing the United Nations Office on Drugs and Crime mission and the Islamic Republic Government’s approach to questions of international law and practice in the context of the wider Iranian human rights tradition.